In his first State of the Union address, President Donald Trump focused on themes of economic success, job creation, and praise for military and law enforcement professionals who strive to keep our communities safe and prosperous. He also alluded to criminal justice reforms that can contribute to those same goals of increasing safety and prosperity. 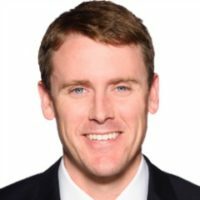 Conservative states like Texas, Kentucky, Kansas, and Georgia have already proven that prison reform can help reduce recidivism rates and corrections spending. And while Trump celebrated job creation, rising wages, a record-smashing stock market, and low unemployment, he now deserves credit for seizing an opportunity to invest in a safer, freer future for all Americans. That was not, however, Trump’s first time considering the issue. Earlier this month, a White House spokesperson told The Hill that prison reform was addressed at a recent Camp David retreat and in roundtable discussions over the last six months with state and federal officials, policy experts, grassroots activists, and faith leaders. In a White House meeting on criminal justice reform earlier this month, Trump told participants that his administration “is committed to helping inmates become productive law-abiding members of society” through mentoring, job-training programs, and drug addiction treatment. Outside that meeting, Kansas Gov. Sam Brownback told The Daily Signal that “smart on crime policies” like mentoring have helped his state improve public safety. Individuals who complete a sentence and earnestly seek a law-abiding life face an uncertain number of collateral consequences that flow from a criminal conviction, as well as occupational licensing requirements, that place many job opportunities out of reach. Heritage scholars have advocated practical incentives for eligible convicted offenders to work, while incarcerated, with nongovernment organizations that provide mentoring, education, job training, and other productive activities that are designed to reduce the likelihood that they return to prison. Now, Trump and his staff can work with Congress to fine-tune pending legislation in the House (e.g., the Prison Reform and Redemption Act of 2017) and Senate (e.g., the Sentencing Reform and Corrections Act and the CORRECTIONS Act) to do just that. The need for criminal justice reform goes beyond prison walls, however, and into the criminal code itself. For example, the Mens Rea Reform Act of 2017, introduced by Sen. Orrin Hatch, R-Utah, would enact mens rea reform (Latin for “guilty mind,” referring to criminal intent in a crime). A Heritage report on mens rea explains the need for Congress to adopt a default criminal intent standard to complete the plethora of statutes and regulations that define a criminal offense, but omit the second of two traditionally essential elements of a crime: a bad act and a bad intent. Congress deserves credit for continuing its important work on criminal justice reform. Together with the Trump administration, lawmakers can take steps to improve how prisoners re-enter society as well as how criminal laws are written. 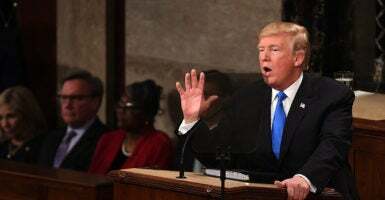 If the apparent success in Kansas and other conservative states is any guide, then the kind of reform Trump alluded to in his State of the Union address would be a positive step toward increasing public safety and prosperity in communities across the country.